An article by REACH on the importance of assessment in humanitarian shelter has been included in the latest volume of Shelter Projects, a publication and online collection of shelter case studies following conflict and natural disaster. 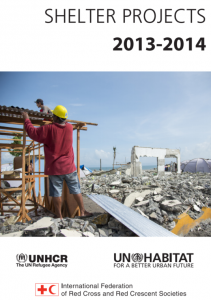 The Shelter Case Studies Project, led by UNHCR, UN-Habitat and IFRC, has collected examples of good practice in shelter and settlement programming since 2008, and currently includes over 150 articles from around the world. Aimed at project managers and humanitarian practitioners in the shelter sector, the publication promotes reflective practice: encouraging all those involved in a humanitarian shelter response, regardless of their technical knowledge, to learn from past experiences. The 2013-14 edition includes a series of opinion pieces. Rather than focussing on a specific shelter project and context, these articles discuss issues faced in many current shelter responses, including security of tenure, cash programming, assessment, urban approaches, and support to host families. REACH’s article on assessment examines how collaborative needs assessment can contribute to a coordinated shelter response. Using examples from the Philippines, Iraq, and Somalia, in partnership with the Global Shelter Cluster, the article discusses the importance of timing, the need for information sharing, and the role of emerging technology in humanitarian shelter assessments.